The truth about Al Qaeda? The other day, I snapped the following photo, in the London Underground. I tried as hard as I could to get the entire thing in my picture. Had I stepped back any further I would have been (a) electrocuted and then shortly after that (b) run over by a train. I have not read this book, which is by Jason Burke. But: Naom Chomsky? “Rumsfeld and his clique”? Something tells me that whatever the nuances of the truth here revealed, America will get the blame for it all and Islam hardly any. I did an earlier posting about William Dalrymple, and the comments there are also well worth looking at to learn more about the man and his views. 11 comments to The truth about Al Qaeda? Judging a book by its cover-quotes may be a mistake. The publisher’s copywriter has probably not read the original book, and is merely selecting review quotes he thinks will help it sell. As notoriously with theatrical posters, these may be yanked out of context. 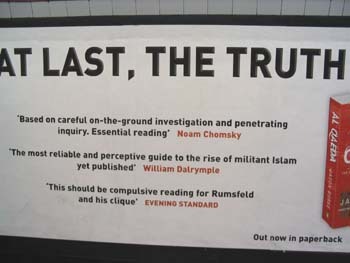 All the poster really tells you is that the publisher’s publicist thinks the target consumers are impressed by Chomsky and don’t know the difference between “compulsive” and “compulsory” but would quite like to compel Donald Rumsfeld to do things differently. Both probably true, sad to say. Rumsfeld has a clique? I’m jealous. I’ve read it. It’s a good, sober, factual book which considers in detail the historical and contemporary roots of Islamic extremism. The author has no particular political axe to grind. 1. Al Quaida is not some sort of worldwide organisation. It is just part (and often a small part) of a wider picture of Islamic extremism. Those who would wish to wage a war against an organisation called “Al Quada” misunderstand the nature of the beast. 2. The steps which have been taken by Western leaders to “defeat” Al Quada have often done more harm than good e.g. Clinton’s cruise missiles into Afghanistan, just at a time when the Taliban were getting fed up with Bin Laden and would have thrown him out. I would recommend it to anyone interested in Islamic extremism, whatever their political views. Julius’ description certainly makes me want to take a look at it, as someone who strongly favours point 1 already, and knows not nearly enough of point 2 prior to 9/11, however obvious it has been since. But then, that’s marketing. If the core audience for books on the conflict is Moore-munching anti-Americans, then that’s who will be sold to, not weirdos like me. Julius, thanks for the comment. In fact, the publishers must be really dumb because favourable comments from the likes of Chomsky will alienate a lot of potential readers, while in fact the book might be quite good. As a result of Julius, I might buy it. No warranties given ….. But I did think it was an informative book. Not everything Chomsky says is wrong. I agree that he is an utter moron when it comes to economics, but some of the criticisms he has made of the USG have at least a grain of truth in them. is this like an anti islam site? i’ve been looking for one for ages! have i found it? No Jade, this is an anti-stupidity site. We have nothing against an particular religion as we do not like evil people of any ‘faith’. is this a factual book on the religion, or does it encourage extremist islam religion?? after these london bombings (im from uk) i really wanna find out more about the bastards that did it, and why..
does anyone have any interesting leads on terrorism? i did a random google search on the subject, tried to find the ‘al-battar’ but they must have got rid of it since..
Niall Kilmartin on Cry God for Harry, England, and Saint George!